One more quick post for today. Sepi and I shopped for rings last Saturday and found two we liked very quickly. (Compared to how I’m sure these things often go. We both had feared it would be a lengthy process.) They had to be resized and yesterday I picked them up. 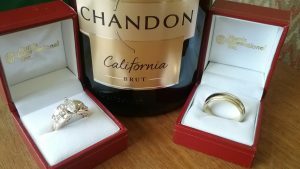 The jeweler was very nice and gave us a bottle of champagne to go with our new rings. Sepi will get to wear hers right away but I will have to wait. I am excited about wearing my ring joining me with Sepi. August.